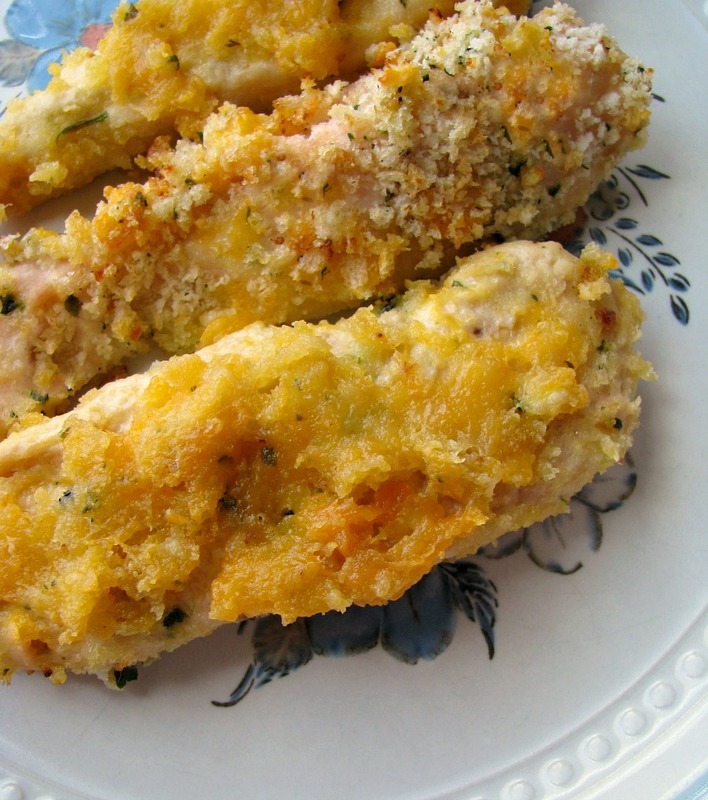 Cheesy baked garlic chicken strips, juicy yogurt dipped chicken breast rolled in cheddar and Parmesan and coated with garlic panko bread crumbs. This week’s #SundaySupper, hosted by Christie of A Kitchen Hoor’s Adventures, of finger foods is perfect for my house. See, my child is almost seven and doesn’t like to eat with a fork. We are working on it, but most things end up as finger foods for her. 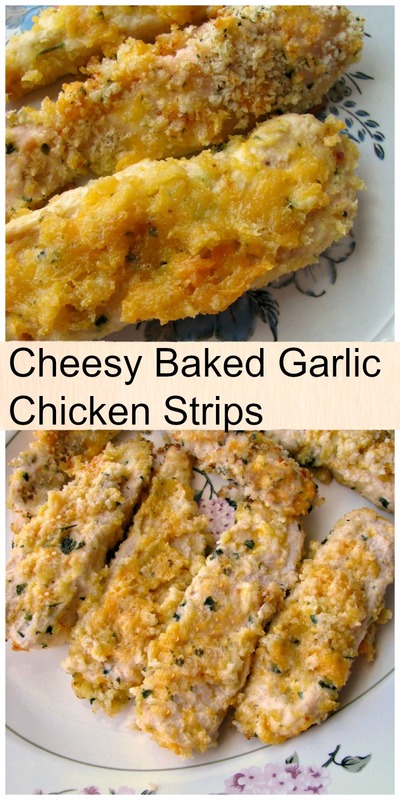 She loves baked chicken, and cheese, and she’s used to me putting garlic in almost everything, so Cheesy Baked Garlic Chicken Strips are perfect for her! 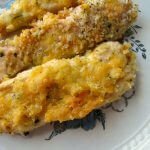 I dip these cheesy baked garlic chicken strips in yogurt like I do with my Spicy Southern Fried Chicken Strips. I love how it makes chicken so flavorful and juicy. I used slices of cheddar that I crumbled up to make the chicken extra cheesy, and garlic panko breadcrumbs give it a little crunch. They are perfect for dinner, or make a big batch for a party, your guests will love them! I recommend not trying to keep these warm in the oven for too long, I tried that once and the chicken got dried out. The breading was still cheesy and good, though. Be careful turning them, or the breading will fall off! Set up a work area with 3 shallow bowls. Crumble the cheddar cheese into small pieces in one bowl,and mix with the Parmesan. Put the Greek yogurt in another bowl. Mix the panko breadcrumbs, garlic powder, and black pepper in the final bowl. Preheat the oven to 400 degrees F. Trim any excess fat and slice each chicken breast lengthwise into three strips. Dip each chicken strip in the yogurt, coat evenly in a thin layer, roll in the cheese mixture shaking off loose pieces, then in the breadcrumbs. Place on baking sheet sprayed with cooking spray. Bake in the preheated oven for around 25 minutes, turning once after 10 minutes (be careful not to remove too much of the breading! ), then again 5 minutes before the end of cooking. Check that the chicken has reached 180 degrees with a meat thermometer. I love that you dipped these in Greek yogurt first. These wouldn’t last long in my kitchen! I love chicken dipped in yogurt. Otherwise, I often think chicken breast is too dry. I think this would be a hit with my kids! I want to say it was a hit with my daughter, but she’s SO picky! This is a must try! Looks delicious and I know my kids would love it. 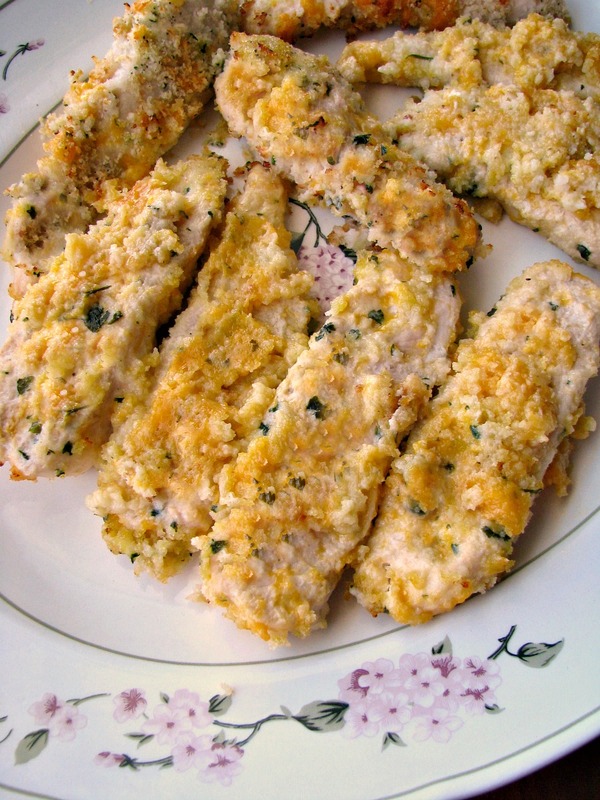 Cheese, garlic, and chicken…my three favorites! Chicken and cheese are a win win! I lvoe the addition of cheese to this breading! Love me some chicken strips! I don’t make them often enough, but you can bet I’m adding this recipe to the menu soon.